Saturday will be my sister Suzanne’s birthday. In honor of her, I thought it would be most appropriate to share the article about Suzanne and her friends that ran in the Atlanta Journal-Constitution last month. The mother mentioned in the article is ours, Van Spalding Schroder. Enjoy. Suzanne Cronk has long wanted to re-create the moment captured in the old black-and-white photograph. It represented two of the best years of her life, shared with her closest friends. 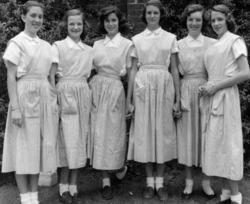 They were eighth-graders in 1952, a girl clique of 11- and 12-year-olds, some smiling, some holding hands, all in their striped pinafores. 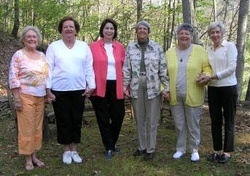 The six of them have remained friends for more than 50 years. They called themselves the “Mission Belles” but the truth is they had no mission except togetherness. They attended the same Catholic school, the Cathedral of Christ the King. They lived in the same Atlanta-area neighborhoods. They spent the night together, walked to Buckhead after school or to Wender & Roberts Drug Store for a Coke. One day, one of their mothers gently informed them they needed to do something with purpose. Arrangements were made for the girls to stop in for a talk with an administrator at St. Joseph’s Infirmary. The Mission Belles soon were calling themselves St. Joe’s Little Helpers, getting to work at 8:30 a.m. as newly minted candy-stripers. They traded sleeping time for visiting patients, filling water pitchers, delivering flowers and making beds. They came face to face with poverty and suffering and death for the first time in their young lives. They never forgot the four boys injured in the car accident; the 18-month-old baby revived after her heart stopped; or the little girl badly burned in a house fire. “We were glad the hospital wanted us,” Cronk said in a newspaper interview in 1954. By then, high school course work and a slew of extra-curricular activities were taking more of their time. Volunteering at St. Joseph took a back seat. In 1957, they graduated from Christ the King High School and, for the first time since they started school, went their separate ways. They went off to college. They married. All but one of them had children and grandchildren. Three of them became registered nurses: Cronk, who now lives in Jasper, and Betty Lou Brennan Douglas and Julie Paquette Smith, both of Florida. Catherine Lehner Hallighan, of Chamblee, has retired from teaching in the DeKalb County public schools. Carol Schnurr Connolly of Pawleys Island, S.C., was an avid volunteer. And Patricia Harrison Robert of New York, worked 13 years as director of communications for Radio City Music Hall, then traveled with the Moscow circus, doing advertising and public relations. Although they mostly lived in different states, Douglas said they stayed in touch “thanks largely to Suzanne.” They talked on the phone. Some got together occasionally for a game of bridge. And every five years, without fail, as many as possible returned to Christ the King for a class reunion. In April, they gathered for their 50th, the first time in 25 years all of them were able to attend. Cronk knew this was perhaps her last chance to get a photo of them in the same line-up as they were all those years ago. They gathered for the photo, a girl clique of 67- and 68-year-olds. Forever friends. Their years at St. Joe, Cronk said, made their relationship richer. Having that old photograph kept it alive. The new one makes it immortal. Top photo: Pictured in 1952 from left are Julie Paquette Smith, Carol Schnurr Connolly, Patricia Harrison Robert, Suzanne Schroder Cronk, Betty Lou Brennan Douglas and Catherine Lehner Hallighan, who called themselves St. Joe’s Little Helpers. This entry was posted on Tuesday, November 13th, 2007 at 5:47 pm and is filed under Family. You can follow any responses to this entry through the RSS 2.0 feed. You can leave a response, or trackback from your own site.